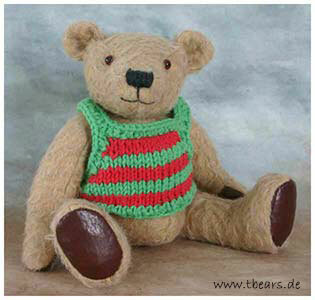 Teddy Bears by Karin Jehle from Lovable Fellows, page 6. Octavio, 21 cm (8 inches). 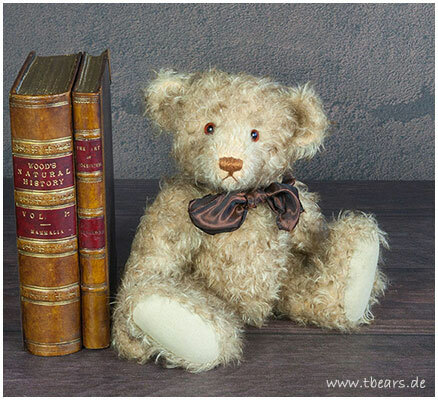 Teddy bear Valdemar is 33 cm (13 inches) tall. 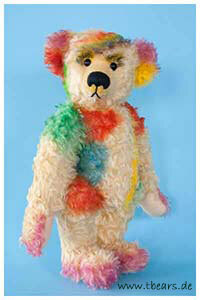 He is made from shining white Schulte faux fur. 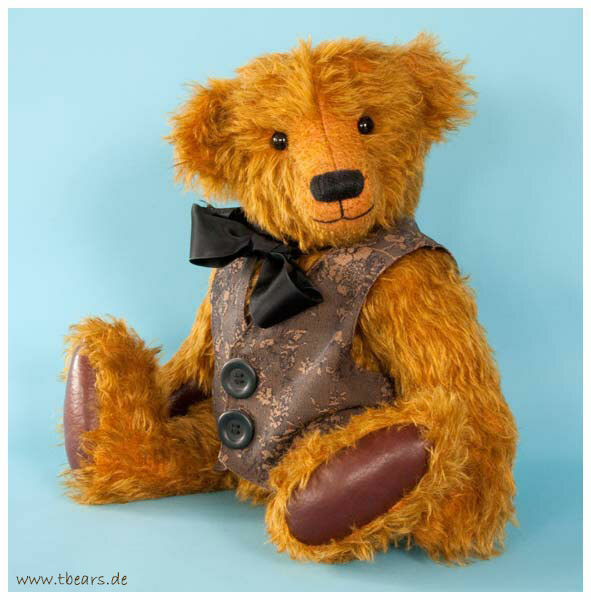 The bear has alive eyes with upper und lower eye lids, airbrushed details and he wears a soft brown leather trousers. 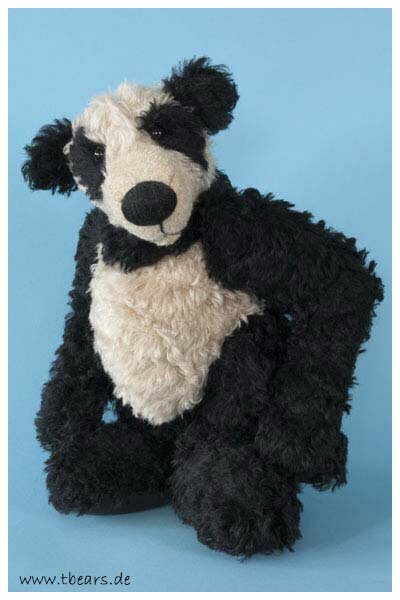 Faithful Sam, 42 cm (16.5 inches). Earl Grey, 31 cm (12 inches). 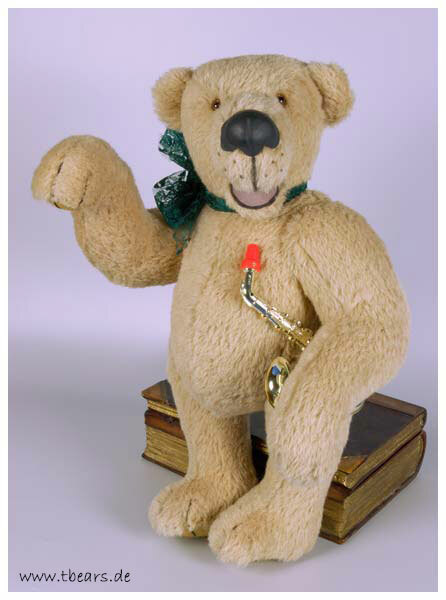 Felix the Saxophon Player is 41 cm (16 inches) tall. He is made from Alpaca. The teddy has an open smiling mouth and has a big moulded nose. 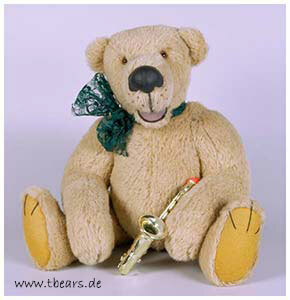 Felix always is in a good mood and he wants to play your favourite song on his saxophone. Rudi is 35 cm (13.8 inches) tall. 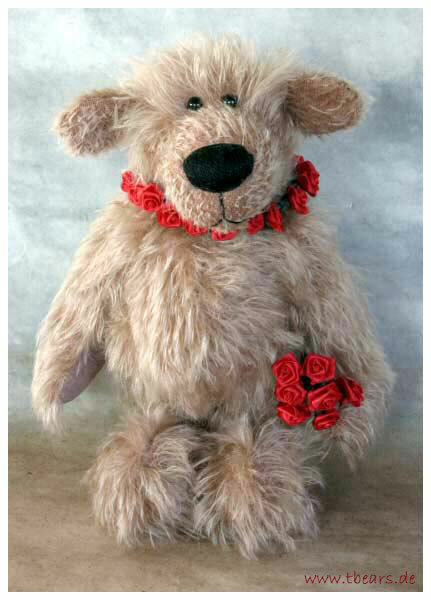 He's made from a very beautiful German Batik Mohair. 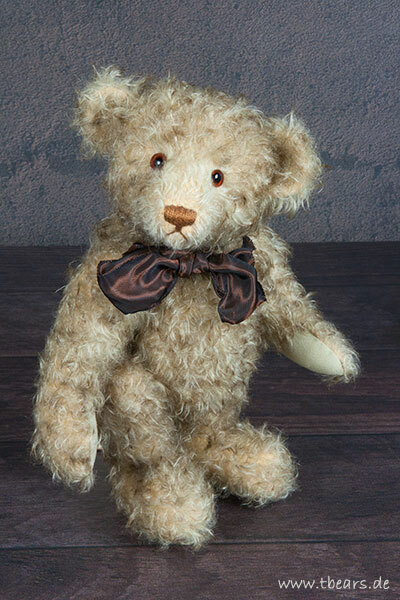 The bear has flexible arms, so he can be posed in many ways. He has padded leather paws. Singing with Birds is 32 cm (12.6 inches) tall. He is made of waved tipped German Schulte Mohair. He has dark brown glass eyes with black pupils. 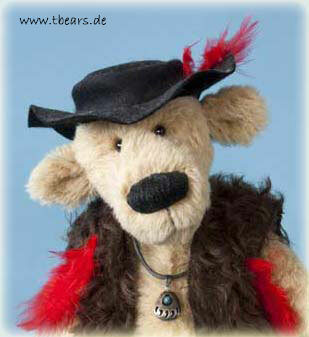 He has a black nose, a tongue and two teeth, which I've made specially for him from polymer clay. 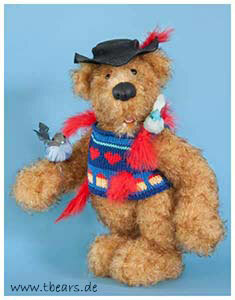 He has a knitted sweater with marabou feathers and a hand sewn felt hat. 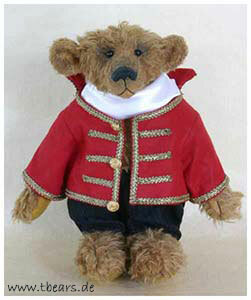 Circus Director Valentino is 35 cm (14 inches) tall. 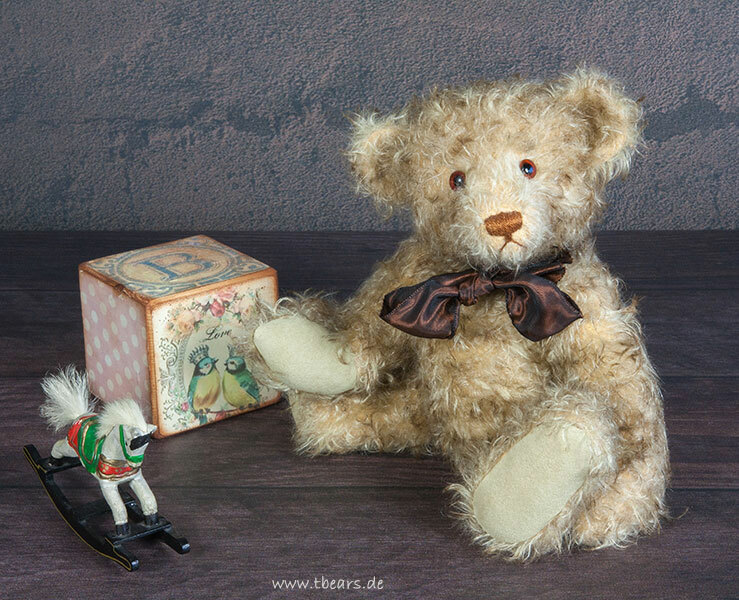 He is made from German Schulte Mohair and he has got an antique treatment. 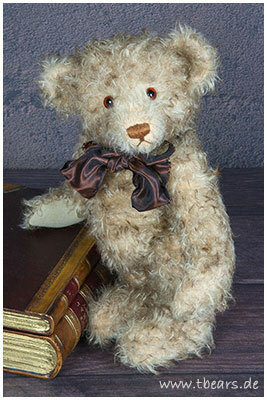 He has antique eyes in the style of 1915 and he is traditionally filledwith excelsior. He has a centre seam. His black stitched nose ist waxed. He wears a black trousers with thin stripes and a red jacket with gold edgings and golden buttons. Edward is 23.5 cm (9.25 inches). Paulo, 22 cm (8.5 inches). 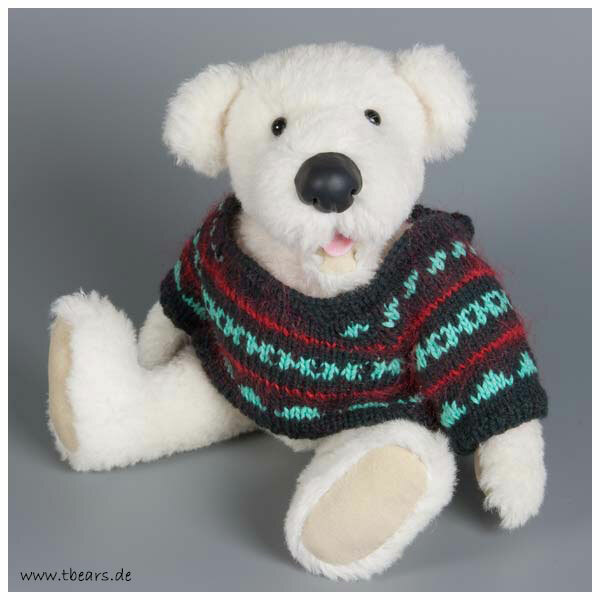 German Schulte Mohair. Black glass eyes. Filled with excelsior and poly. Antique jacket. 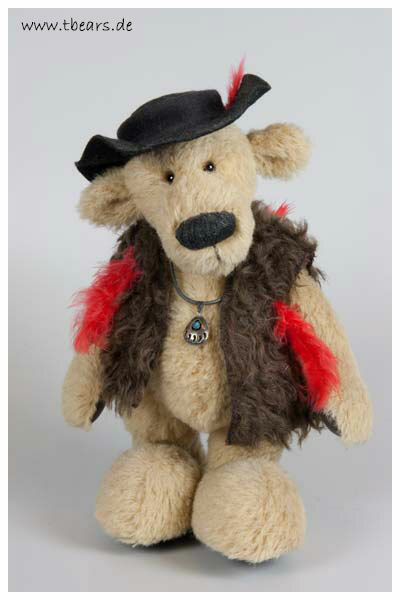 Amulet Bear, "Bear Paw", 27 cm (11inches). Bear paw is an amulet bear which protects his owner and brings him luck. He carries an indian protection amulet of genuine silver 925 and a turquoise stone at a leather collar. This amulet has the form of a bear paw. The bear paw is an Indian symbol for physical and intellectual strength. It represents similarly courage and protection for a quiet well-considered behaviour, so that dangers can be recognized on time. 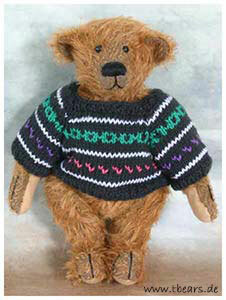 He is a free standing bear made of alpaca. He has brown glass eyes, a brown handmade mohair jacket with marabou feathers and a black handmade felt hat with a marabou feather. Teddy bear Angelo is 22.5 cm (9 inches) tall. Snow-white Mohair, black glass eyes. Filled with poly. 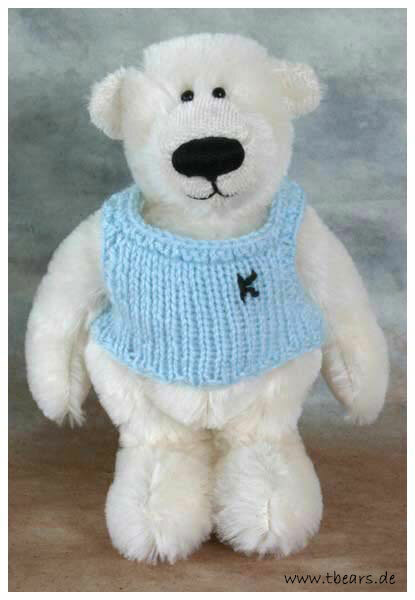 Hand-knitted ice blue pullover. 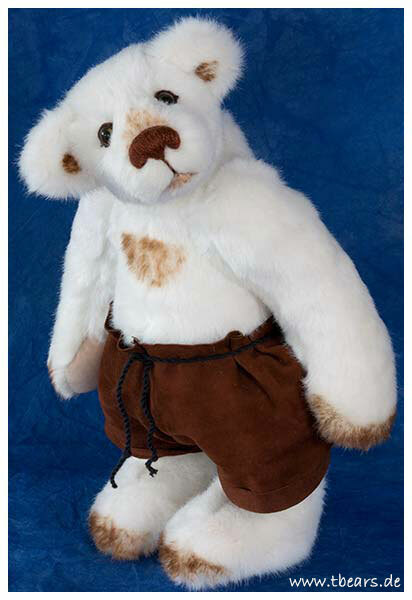 Snowflake is 25 cm (10 inches) tall. Snow-white Alpaca, modeled nose, tongue and teeth. Hand-knitted pullover. 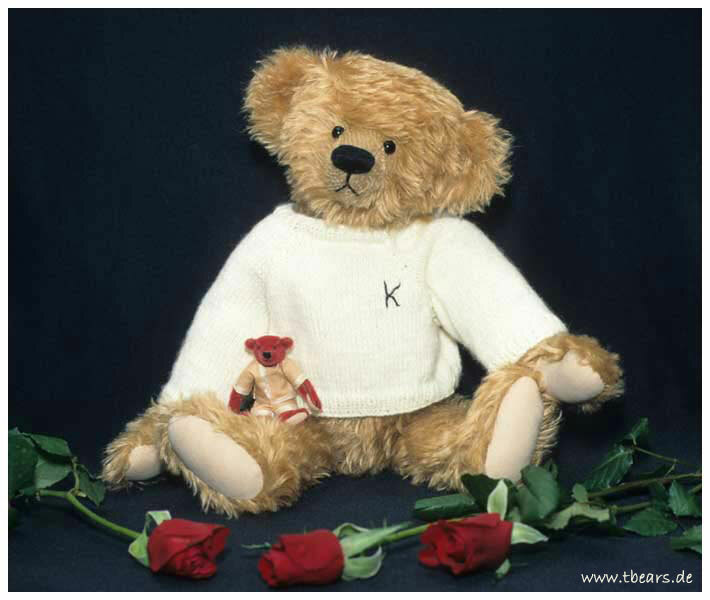 Karl is 37 cm (14.5 inches) tall. Centre seam, German Schulte Mohair, old shoe button eyes, modeled nose, filled with fiberfill, wood wool and pellets. 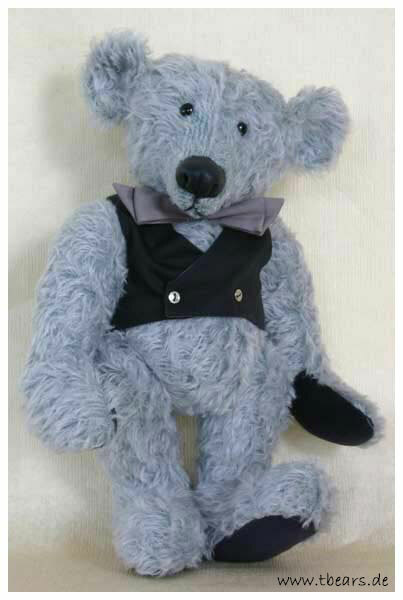 Vest and bow tie. 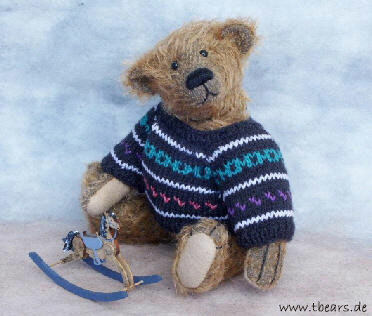 Roland is 33 cm (13 inches) tall. He has an open mouth. 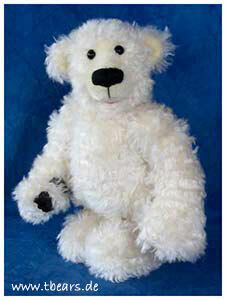 He's made from swirled white German Schulte Mohair and he has padded appliquéd leather pads. Happy Otto nothing likes more than to tell you storys from "the good old days". 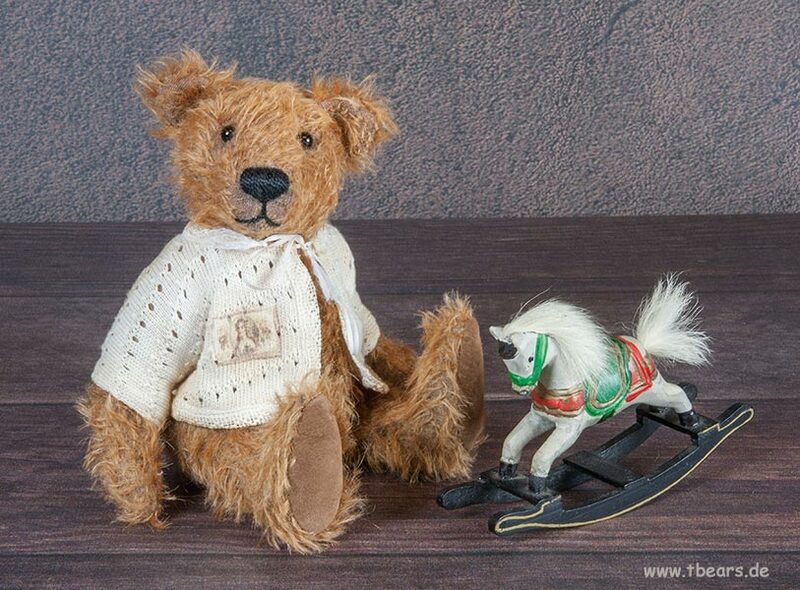 He's inspired by the early Steiff bears. 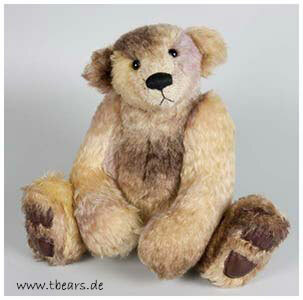 The bear is made from German Schulte Mohair and he has got an antique treatment. 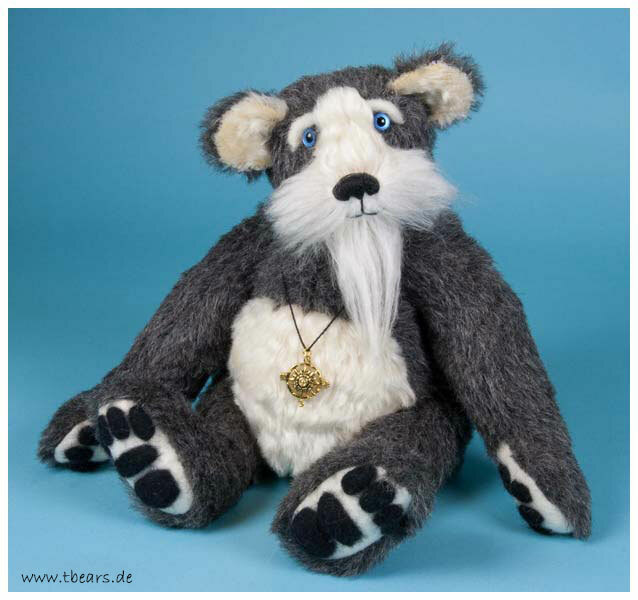 Otto has big brown glass eyes with black pupils and is filled with poly and wood wool. 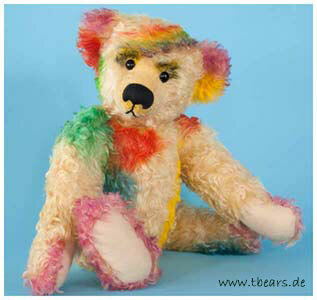 Teddy bear Rainbow, 40 cm (16 inches). Sometimes you find something better than gold on the end of a rainbow... Airbrushed German Mohair. Filled with poly. Black glass eyes. Karl-Guenther, 23cm (9 inches). 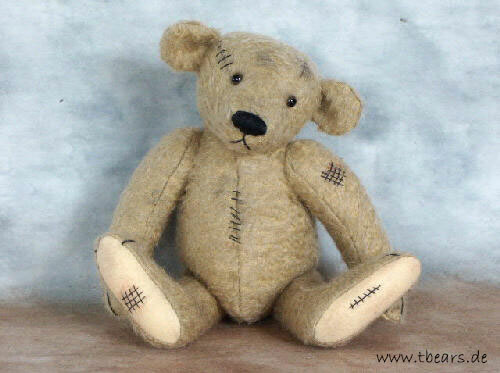 Traditional Teddy. 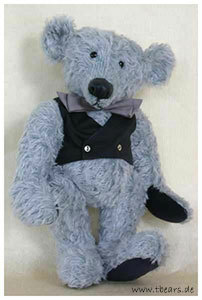 German Schulte Mohair, shoe button eyes. Filled with excelsior and very few poly. Hand knitted sweater. Panda Konstantin, 35 cm (14 inches). He is a very heavy and cuddly bear. Kontantin is a dreamer and his head is full of poetry. 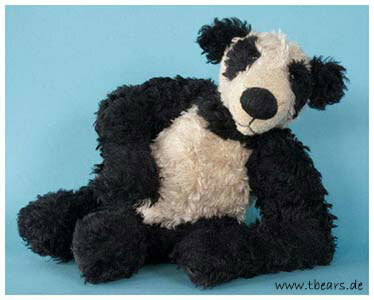 He is made of black and white German Mohair, he has black ball eyes and leather pads. The bear is filled very heavy with poly and pellets. 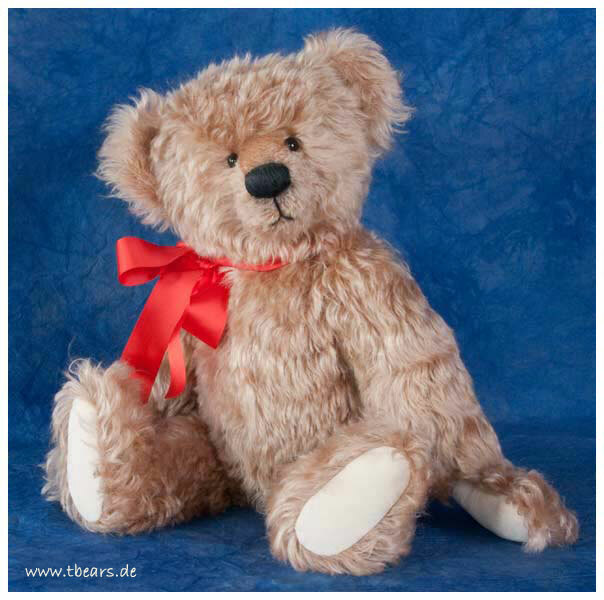 Teddy bear Wolfgang, 40 cm (16 inches). He is a gentle soul and he's got a heart of gold. 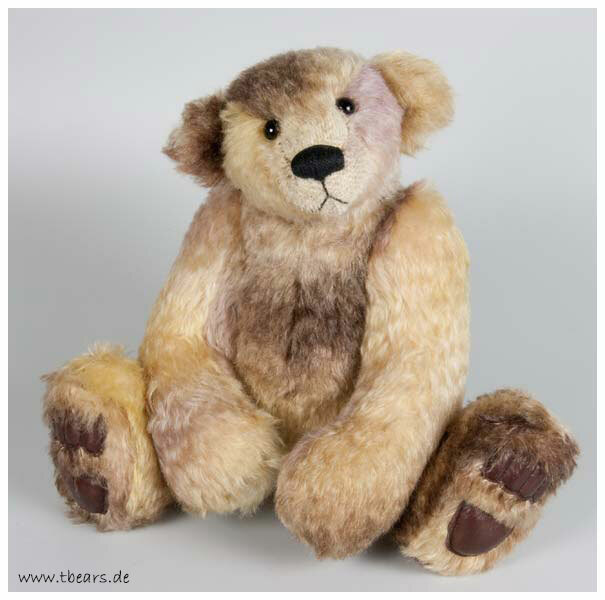 Wolfgang is made from blond Mohair. He has antique eyes in the style of 1915 and wears a handmade white pullover. Lara, 40 cm (16 inches). With her dreamy black eyes she loves to watch the stars. She has a waxed nose and is made from German rosé Mohair, she has antique eyes in the style of 1915.